Renovating your kitchen is a great investment, and one of the best ways to increase the value of your home. Not only that, a renovated kitchen is more fun to cook in – and it’s a great place to host friends and family for parties and get-togethers. But the process of actually getting your kitchen renovated is inconvenient – to say the least. While the results are well worth it, it won’t exactly be a picnic. So in this guide, we’ll take a look at the top 9 tips we’ve got to help you survive your kitchen renovation! 1. Make Sure To Create A “Temporary” Kitchen – Before The Project Starts! Don’t just leave your appliances in the kitchen. Set up a temporary kitchen in your dining room, living room, or anywhere else that’s convenient for you. Keep your crock pot, toaster oven, microwave, coffee machine – whatever you may need to create simple meals. You can also consider investing in a portable camp stove from an outdoor store – or grilling out more, if the weather is nice! Having some options for easy meals at home is a great way to lessen the inconvenience of not having access to your kitchen. You’re not going to enjoy cleaning your tableware and dishes in your bathroom sink, or with the garden hose. Stock up on paper plates, disposable tableware, napkins, and other essentials – and skip the dishes. You’re probably going to be eating at restaurants quite a bit during your renovations. So make sure you put those purchases on a reward credit card that offers extra points on restaurants – and consider signing up for a service like Ritual or OpenTable for even more rewards. You’ll be able to stretch your dollar! You should put dust covers on, well, just about everything. We do our very best to minimize dust in your home during the renovation process. However, we can’t eliminate all dust so to keep your home as dust-free as possible we suggest covering up your furniture, artwork and other valuable items. You should also cover your temporary kitchen with plastic sheeting and dust covers while you’re not using it. This will prevent dust and dirt from getting into your food. 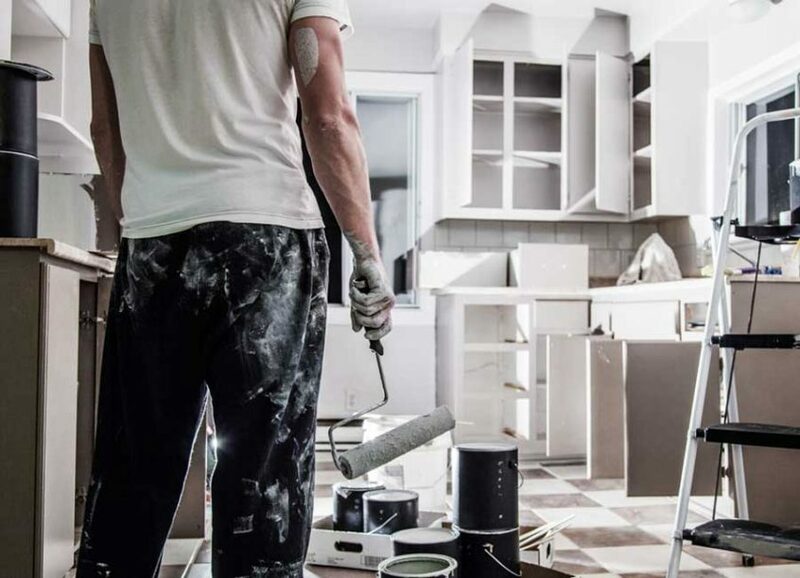 Getting away from your renovation can be a great thing, especially if you have a trustworthy contractor who can handle things on their own. Consider taking that weekend cabin getaway, visiting your old classmates who live a couple states away, or even planning a longer family vacation during your renovation. As long as you are confident in your contractor, you don’t have to worry about micromanaging the process – and most of it will be done by the time you get back! If you’ve ever peeled back the curtain on a home renovation project, what you see might surprise you. Yes, there will be dust, debris, tools and supplies. All of this is part of the journey. Don’t freak out. It’s a process – and at the end, you will get your dream kitchen. You should definitely invest in some child and pet protection barriers, especially if you have small kids. Use these to block the entrance to the kitchen, and designate a new “play space” for your kids. Pets should be kept in rooms away from the noise of the renovation as much as possible, to decrease stress levels. They should also be isolated or kennelled when you’re not home. The noise and activity of a renovation are not exactly pleasant for your neighbours. Keep them in the loop, and let them know that things won’t be dragging on for too long! Follow These Tips – And Survive Your Renovation In Style! Your renovation project is not going to be a cakewalk – but the results are worth all the effort. So follow our tips, and enjoy your newly-renovated kitchen!